This page is meant to serve as a guide through the reimbursement process. The GSA follows procedures outlined by UMBC Financial Services, and so they are subject to immediate change in order to reflect GSA or UMBC policies. Set an appointment with the current Travel and Grants Coordinator between the hours of 9am- 3:30pm Monday – Thursday. Follow the steps below in order to properly address each of these requirements. GSA cannot reimburse for services purchased through any type of rewards programs including but not limited to airline rewards points, gift certificates, etc. If you have any questions about this process, please call the Office of Graduate Student Life (OGSL) at ext. 52773 during office hours (see page footer) and ask for the Grant Coordinator. Below are snippets of what the RRF looked like at the time this page was made. The colors have been added to mark the regions the student (or department) should be able to complete. The green regions should be completed by the student (see note on Personal Information below). The orange regions should NOT be modified by the student, they will be filled-in at the OGSL. All other regions should NOT be modified. All dates should be in MM/DD/YYYY format. The GSA encourages students to fill-in the RRF digitally, but students should come to OGSL to sign finalized paperwork before reimbursement can be submitted. It is at this time that the student should fill-in the Social Security Number (or ITIN) so as to avoid sending personal information through e-mail threads. If the student would prefer to fill-in an address in-person, that can also be done off-line and in the OGSL. If you are unable to physically come into the OGSL, you may sign the form, scan it to our Grants Coordinator by email and then call the office to provide your Social Security or ITIN number. Additionally, please feel free to redact any information unrelated to your expenses on the bank/credit card statements. Select “Travel Expense” if you traveled to a conference, workshop or interview. Select “Miscellaneous Expense” if you purchased research equipment, reimbursed research participants, or traveled for data collection or research. OGSL Staff fill this portion of the form. Fill the first row in with the travel dates. 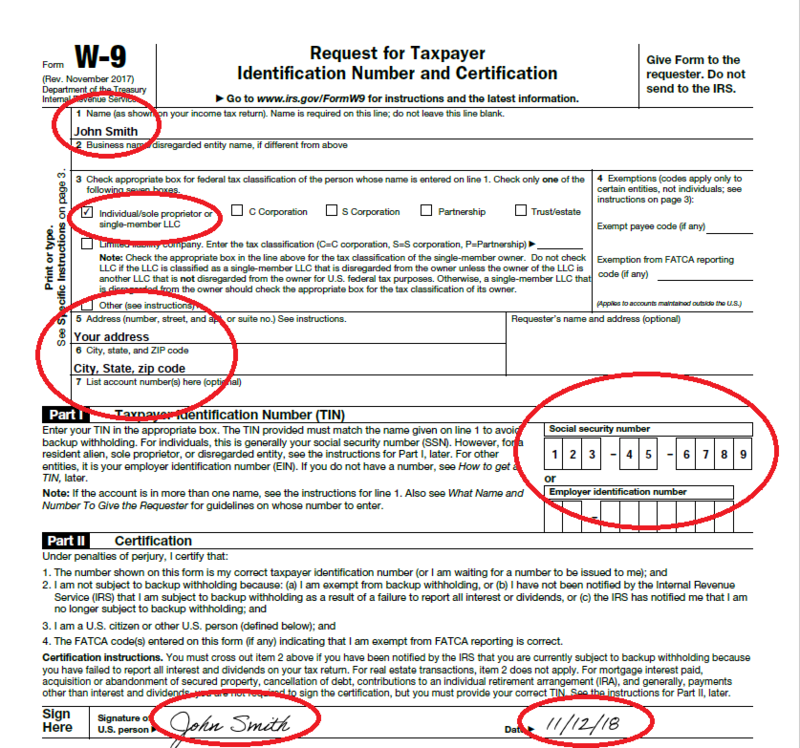 If you were on travel for more than seven days, you will have to complete two separate forms. Dates without any expenses may be left out of this table. If you would like to be reimbursed for the standard US per diem, enter $10 for breakfast, $12 for lunch, and $25 for dinner for each day for which you would like reimbursement. If you would like to be reimbursed for more than a standard meal in a high-cost area within the US, you will need to provide detailed, itemized food receipts to confirm each expense placed in the appropriate meal and date location in the table. Expenses to be reimbursed must have accompanying receipt to confirm costs. In-state expenses must have MD State Tax removed from expense quoted in table. Registration costs should be listed under “Miscellaneous Expenses”. On accompanying receipts, the mode of payment should be listed. If paid in cash, only the receipt confirming cost is necessary. If a payment was made with a card and the last four digits of the card are not reflected on the receipt, a bank/credit card statement must also accompany the receipt. It is safest to always include bank statements reflecting the same costs you will be quoting on the table. If a non-detailed receipt is submitted, only $10.00 will be reimbursed. If receipts are lost, we will not be able to process reimbursement for those purchases. For the purposes of accountability on per diem amounts, you must include travel details starting and ending with “Home”. Include times of travel for each day you were away for your conference/professional development event. Please include any layovers or stops. Confirmation of bus/rail/air travel is required to reflect these dates & times. Tickets, itineraries, and confirmations of bookings are accepted. For reimbursing mileage with a personal vehicle: any mileage incurred may be quoted here with an accompanying Google Maps screen-shot confirming mileage. Place this mileage in the “Auto Mileage” row on the appropriate date. Dates with no travel can be left out of this table. The total amount to be reimbursed for mileage is tabulated at the bottom of the “Expense By Date” table. Please print the name and telephone number of the student. The student will be expected to sign and date in-person in OGSL. Back to the “Distribution of Charges” section! Ensure that registration costs are put into the appropriate account (by row) and that all other costs are put into the appropriate row. If this is unclear or a certain expense seems to fall into more than one account type, please call or e-mail OGSL. Make sure the “Total” amount tabulated here on the bottom-left matches the “Total Expense” amount at the bottom-right of the “Expense By Date” table. In all cases, remember for what amount of reimbursement you have been approved. You don’t need to provide proof of purchases or quote them on this form if you don’t plan on being reimbursed for them. Assemble the RRF, all receipts, all cost-confirming bank/credit card statements, all itineraries, conference agenda, receipt for funds disbursed to study participants, etc. Bring the packet to the OGSL during office hours (see page footer), or schedule an appointment with the Grants Coordinator if you have questions. We ask that you (1) e-mail the RRF to gsa@umbc.edu and (2) print out all other necessary documentation. This is the average amount of time it takes for GSA to process your paperwork, submit your packet to UMBC Financial Services and for the State of Maryland to process your payment. To track your reimbursement, please check through the Comptroller of Maryland website. Step 6: Apply for Another Grant! It’s your money! Use it!